Are you having a bad day? A bad week? I can empathize, but please quit complaining. Last week, the executive director of Nebraska Wildlife Rehab spent an hour untangling the tails of six baby squirrels who got trapped in what the Omaha World-Herald described vividly as a “six-headed animal cluster.” Life is hard, but it would be nice if we could all take a moment to appreciate that we are not glued to our five siblings by tree sap. So how did this squirrel-king form? 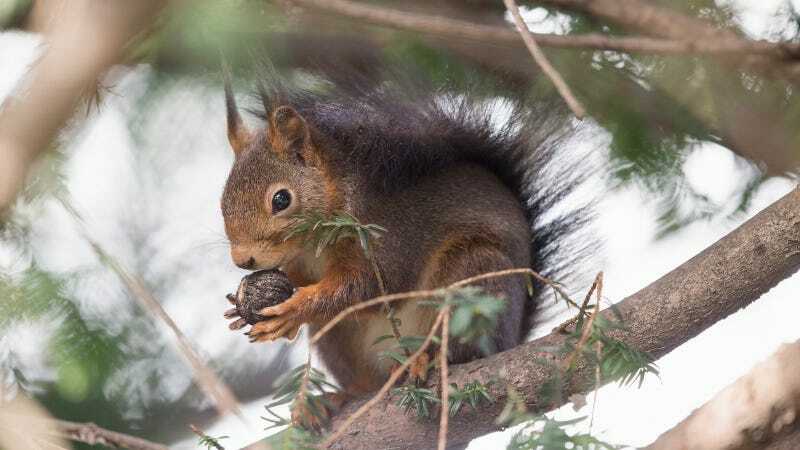 [Laura] Stastny, executive director of Nebraska Wildlife Rehab, said their tails got stuck together because of tree sap. Then their tails became knotted as the eight-week-old squirrels wrestled around in their nest. She said it wasn’t the first case of tangled squirrel tails her group has dealt with. The rescue group gets one such case every year or two. Tree sap is often involved. But sometimes string ends up in a squirrel nest and that causes the tangle, Stastny said. It looked like “a tug of war,” Craig Luttman, who discovered the squirrels, told the World-Herald. “All were going in different directions.” So much so, in fact, that some of the squirrels will need surgery to repair their tails. I actually was not, personally, having a bad day, but now I am!